The second meeting of the newly-created IAAF World Indoor Tour saw seven world-leading performances. 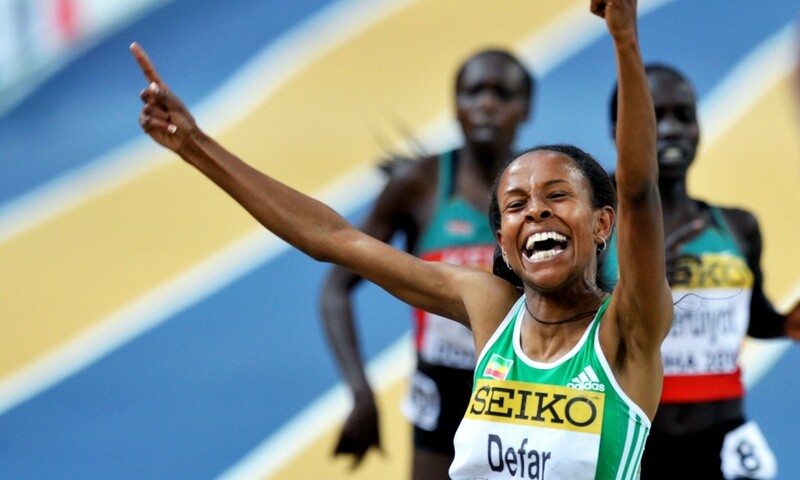 At the New Balance Indoor Grand Prix in Boston, Meseret Defar contested her first track race since 2013 following her baby break and injury and ran a fast 3000m. She clocked a world-leading 8:30.83 ahead of Abbey D’Agostino’s 8:56.77. Olympic pole vault champion Jenn Suhr cleared 4.82m for victory and went on to attempt what would have been an overall world record height of 5.07m. The event also saw improvement by Ethiopian Dawit Seyaum in the 1500m as she clocked 4:01.86 to go to 14th on the world indoor all-time list. In second Brenda Martinez ran a 4:04.58 indoor PB. There was a US indoor record for Natasha Hastings as she ran 36.25 in the 300m for the fifth best performance of all-time. Another top world lead was set by USA’s Kurt Roberts as he threw 21.57m in the shot put ahead of Reese Hoffa’s 21.02m and Tomasz Majewski’s 20.14m. Vernon Norwood ran 32.70 in the 300m, Boris Berian 1:15.51 in the 600m, Andrew Wheating won the 1000m in 2:18.68, Dejen Gebremeskel the 3000m in 7:42.94 and Nick Willis won the mile in 3:53.27. In the 60m sprint battle, Mike Rodgers beat Trayvon Bromell 6.53 to 6.57. A superb field in the women’s 60m hurdles saw Brianna Rollins clocking 7.87 over Nia Ali’s 7.89 and Janay DeLoach Soukup’s 7.92 (she had also earlier won the long jump with 6.63m). Tiffany Porter was seventh with 8.04. In the women’s 60m, winner English Gardner posted 7.15 ahead of former long jump world champion Tianna Bartoletta’s 7.20. Sam Kendricks with 5.77m in the pole vault beat world champion Shawn Barber with 5.67m. Germany’s Kai Kazmirek won the International Combined Events meet in Tallinn with 6111 points for a world lead. In second Mathias Brugger set a 6060-point PB and in third was Petter Olsson from Sweden with 5837 points. Germany’s Claudia Rath scored a personal best of 4688 points in the pentathlon after 8.45; 1.81; 12.85; 6.40 and 2.09.19. Michelle Zeltner equalled her Swiss record of 4369 points for second. There was no world record for Florence Kiplagat this time but the Kenyan won the Barcelona Half Marathon in windy conditions for the third year in succession. Kiplagat had suffered from flu in the build-up but still posted a solid time of 69:19 before the London Marathon. Sweden’s Isabellah Anderson was second in 70:50 with Portugal’s Jessica Augusto third in 70:58. The men’s race was a close encounter with Vincent Kipruto winning by one second in 62:54 ahead of European champion Daniele Meucci (62:55) and Ethiopian debutant Abdi Fufa (62:57). “I have really enjoyed the course. They told me it was a fast circuit but I didn’t expect it to be so fast. Without a doubt, the best has been the support of the crowd, and it was a pity the wind because it prevented me to achieve a better time,” said Kipruto. World marathon champion Ghirmay Ghebreslassie was a late withdrawal due to injury. Long jumper Jeff Henderson won the 60m during the second day of the Don Kirby Elite in 6.63 ahead of Emmanuel Matadi, also with 6.63, and Josh DeLoach with 6.67. In the 400m, Marcus Chambers clocked the fastest with 46.53. Sasha Wallace for the first time in her career broke eight seconds in the 60m hurdles with 7.96 win over LaTisha Holden-Palmer’s 8.14. Hannah Cunliffe won the women’s 60m in a 7.20 PB. Daye Shon Roberson with 53.08 beat world-class 400m hurdler Georganne Moline with 53.12. Jill Camarena-Williams won the shot with 18.03m in her first indoor meet since 2012, while Oregon clocked 3:31.96 in the women’s relay. Jeroen D’Hoedt claimed victory at the sixth Cross Cup race, winning the senior men’s 9.7km in 28:02 by 19 seconds ahead of Steven Casteele. In-form Brit Kate Avery took a decisive win in the 6.2km in 20:17 ahead of Veerle Dejaeghere (20:33) and Jenny Nesbitt (20:41). Javon Francis won the main 400m race at the Camperdown Classic in Kingston with 46.21. Yohan Blake returned to racing with 48.14 in seventh. Javere Bell won the other race in 46.75 over Britain’s Zharnel Hughes with a 46.95 PB. Young 400m talent Christopher Taylor improved over 100m to 10.44.